It's not often you stumble across a company that has brought sustainable practices to almost every corner of its business. Some produce products that benefit others, but the way they're made doesn't quite help the environment, or it's tested on animals; other companies take the opposite approach and use eco-friendly practices when producing their goods, which is great, but there is no sense of social obligation to accompany it. 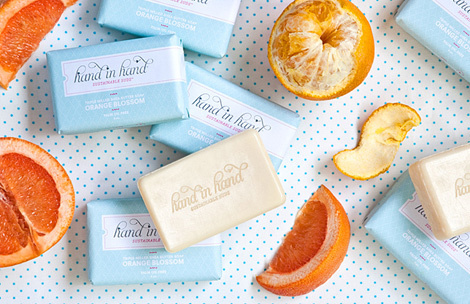 Bill and Courtney of Hand in Hand soap, however, have it going on. 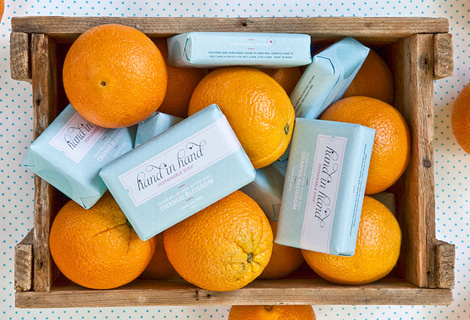 Started in 2011, the soap company produces natural soaps from sustainably harvested materials, and also participates in the increasingly popular one-for-one mantra, where for each bar of soap purchased, they send one to someone in need. Some of you might think that a bar of soap for people living in an impoverished area of the world might seem less important than, say, food, but according to Courtney, that is not the case. "The goal was to come up with a household product people use every day, that had the power to save lives," she says on the company's website. "After 3 years of brainstorming, we came across an article reporting that each year over 5 million people die of diseases caused by poor water quality and lack of proper hygiene. After further research, we discovered that half of those deaths could be prevented with just a single bar of soap. It was at that moment that Hand in Hand was conceived." 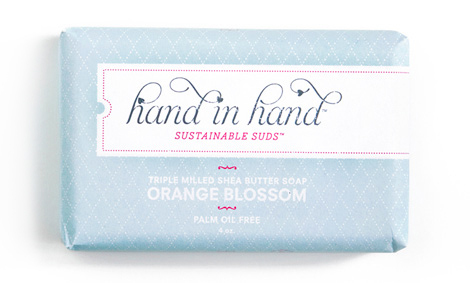 On top of that, each bar is 100% eco-friendly, biodegradable, contains ingredients ethically harvested from sustainable resources, is fair trade, cruelty-free and palm oil-free; the packaging is made from 30% recycled materials; the shipping boxes are certified at the silver level of the Cradle to Cradle standard of the U.S. Environmental Protection Agency; and with each purchase, the company works with SeaCology.org to save 50 square feet of rainforest in Southeast Asia, and purchases corresponding carbon offset so each shipment becomes carbon neutral. Here's hoping the have more products in the works.